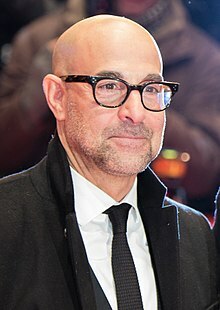 Stanley Tucci (born November 11, 1960) is an American character actor, writer, producer and film director who is known for his roles in Winchell and in The Lovely Bones. He has won two Golden Globe Awards and two Emmy Awards. Tucci was born on November 11, 1960 in Peekskill, New York. He was raised in Katonah, New York. He studied at John Jay High School and at SUNY Purchase. Tucci was married to Kathryn Spath from 1995 until her death in 2009. Then he was married to Felicity Blunt since 2012. He has three children with Spath. He currently lives in London. ↑ "Stanley Tucci Biography (1960–)". FilmReference.com. Retrieved August 8, 2012. This page was last changed on 8 September 2018, at 15:11.